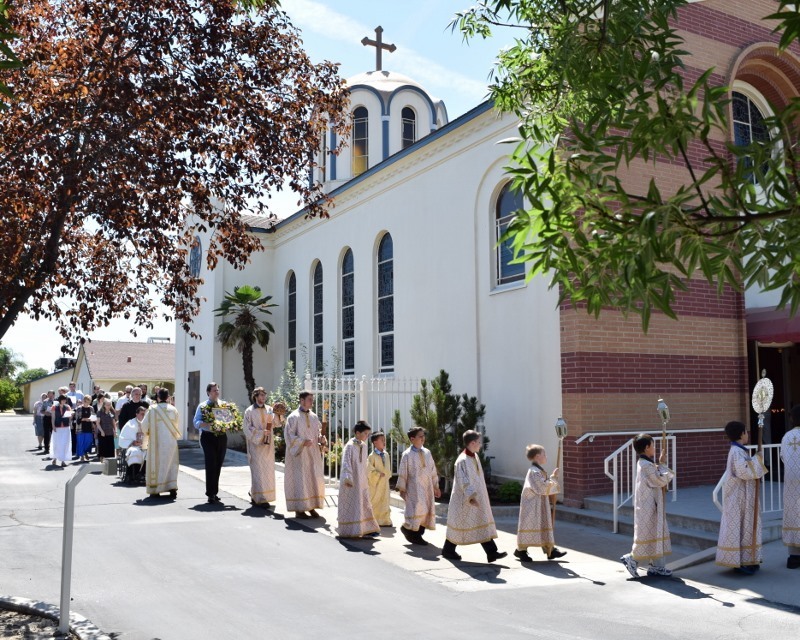 Fresno, CA - It was a very beautiful and quite hot morning on July 13, 2014 in the Great Central Valley when His Grace, Bishop Maxim, arrived at St. Peter the Apostle Church in Fresno, California. The bells were ringing, the altar boys were smiling, and the choir was singing as the parish clergy greeted His Grace. 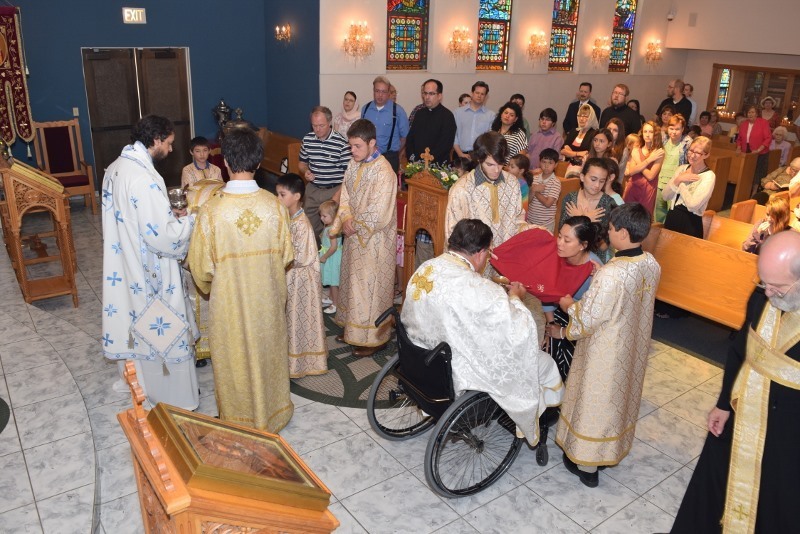 Father George Gligich held the gospel with Deacon John Davis censing as the procession moved through the center of the church surrounded by a large, enthusiastic, and overjoyed crowd consisting of both regular parishioners and visitors. 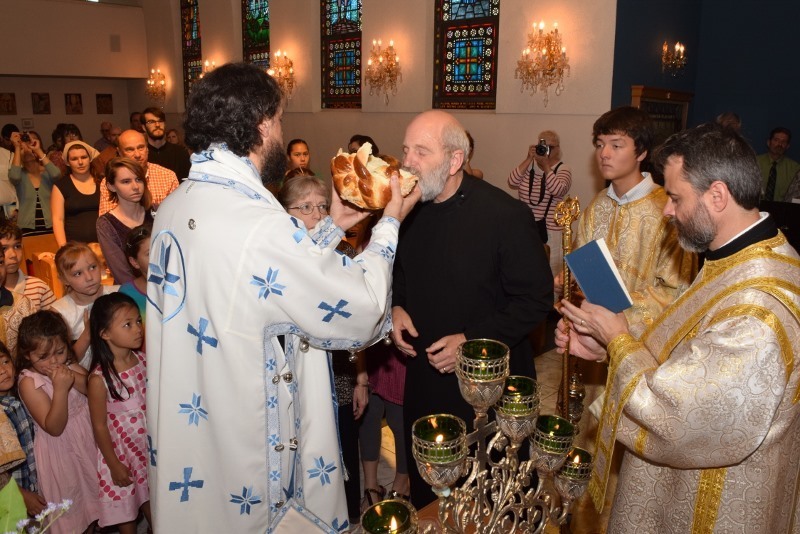 Our dear Bishop venerated the most holy relics of St. Peter and St. Paul, which were present thanks to the goodness of Father Gustavo Lopez of San Joachim Catholic Church in Madera, who brought them and stayed for Liturgy in honor of our church’s feast day. 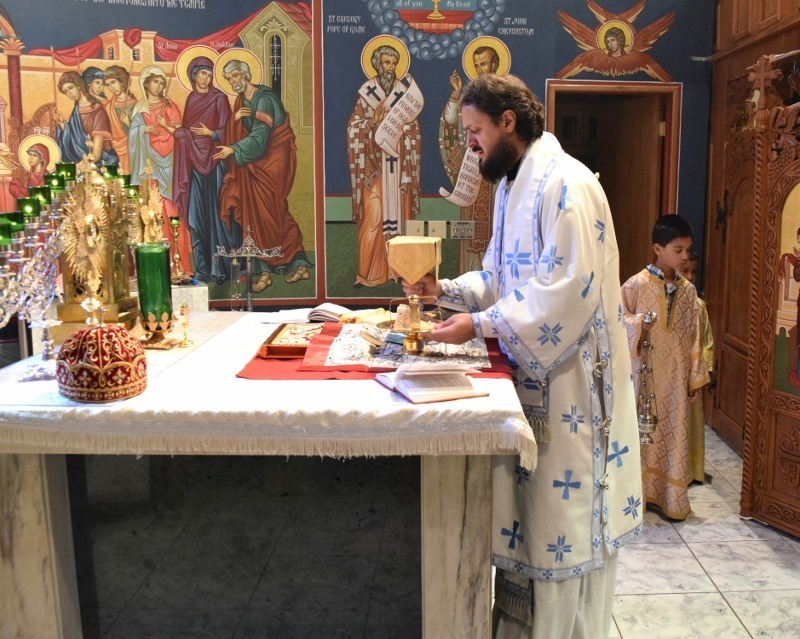 The entrance and vesting prayers preceded a blessing from His Grace and the beginning of the Divine Liturgy. 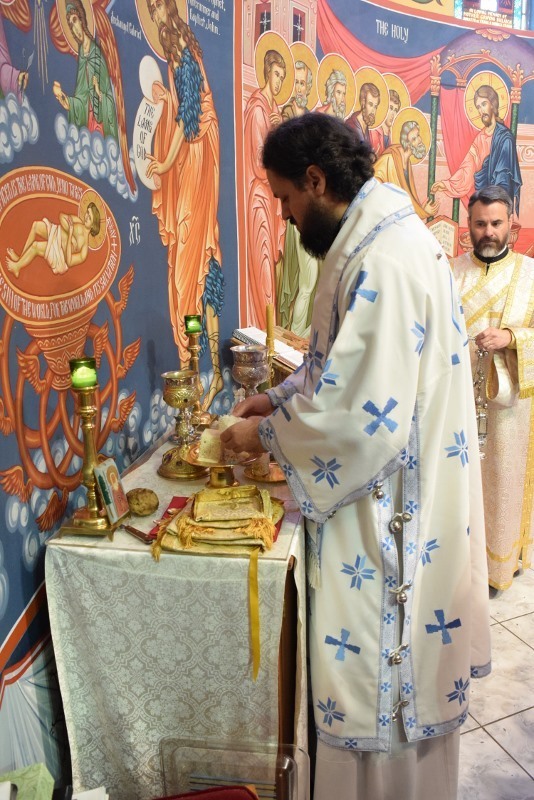 From the first to the concluding prayer, our beloved Bishop presided over a Liturgy full of the beauty, power, and grace of God apparent to all and made possible only by the presence of the Holy Spirit. Following the reading of the Gospel, His Grace gave a sermon that reached the minds and hearts of all who had ears to listen. He brought to light for all of the faithful that our actions in this world will always affect the rest of the word, both material and spiritual. We must choose what is right in God’s eyes yet never despair when confronted by evil, for all evil flees in the presence of our Lord. Moreover, Christ’s redemption works in both this world and the spiritual world simultaneously and inseparably. To fulfill time in history means to confront evil and the divisive powers, which call for the postponement of the End. The demons ask Jesus: “have you come here to torment us before the time” (Matthew 8:29). The demons know that their end is torture, eternal hell and they wish the postponement, as much as possible, contrary to the exclamation “Maranatha” or “Come, O Lord”, of the first Eucharistic liturgies. Anyone who is dominated by evil prays that the Kingdom not come quickly. Here lies the mystery of freedom in history. So, here we see that, thanks to the Resurrection-event, the future relates to our time in a different way; precisely, the future belongs to those who will rise from the grave. “What have you to do with us”?, the demons ask because there is not and never will be any reconciliation between demons and God. So they say: “Leave us alone! You mind your work and we shall mind our work”! They want a division in the existence, gap, two separate areas. Many times we also organize our life, social and political, and we say to the Church: “Do not interfere with what concerns the world. The world belongs to Satan”. “What have we to do with you”?—this is a method that evil has invented so that it survives and enables it to have some influence over the world. Furthermore, they add the phrase “Son of God”! Here it is clear that faith is not enough to recognize that there is God. “Even the demons believe and tremble”! It is trust in God that He can make the impossible possible. Demons teach us what the faith is not about. The final conclusion from the Gospel story is that evil does not influence only man; it is transferred from man to the creation. The ecological crisis today witnesses this the transfer of evil from man to the innocent creation. His Grace concluded that we have responsibility for the whole creation. On this day when we commemorate the Holy, Glorious, and All-Praised Twelve Apostles, His Grace reminded us that the Apostles point to this and show us that God does not just give life but is life and love. 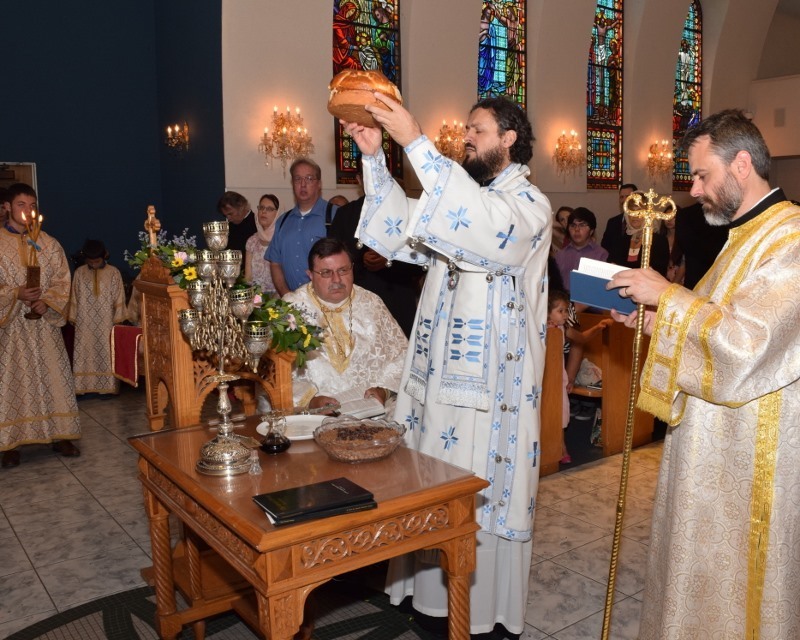 The Liturgy then continued with many faithful receiving the body and blood of our Lord, God, and Savior Jesus Christ. At the conclusion of the Liturgy, there was a procession around the church with a stop in the east where our dear Bishop read the Gospel. 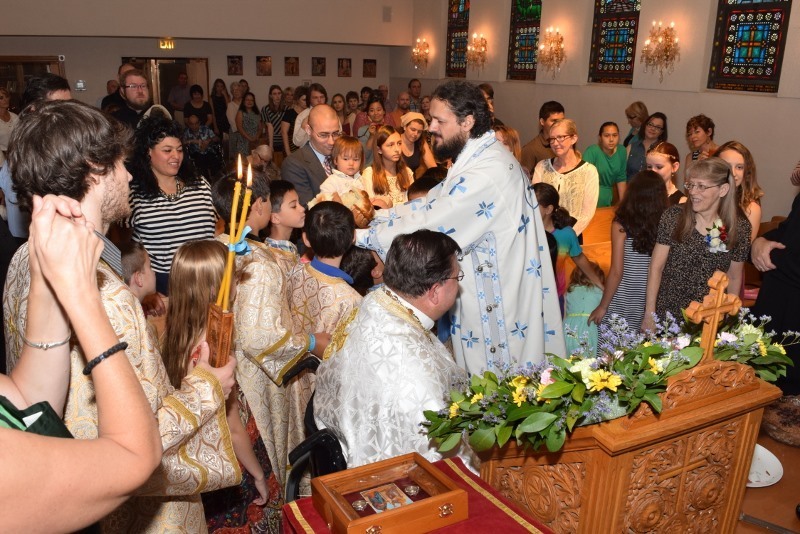 Upon entering the church, the parish celebrated its Slava with the blessing of the kolac and wheat. Protodeacon Brad and Djakonica Peggy Matthews were the Kum and Kuma honored for their many years of giving their time and talents to the church. 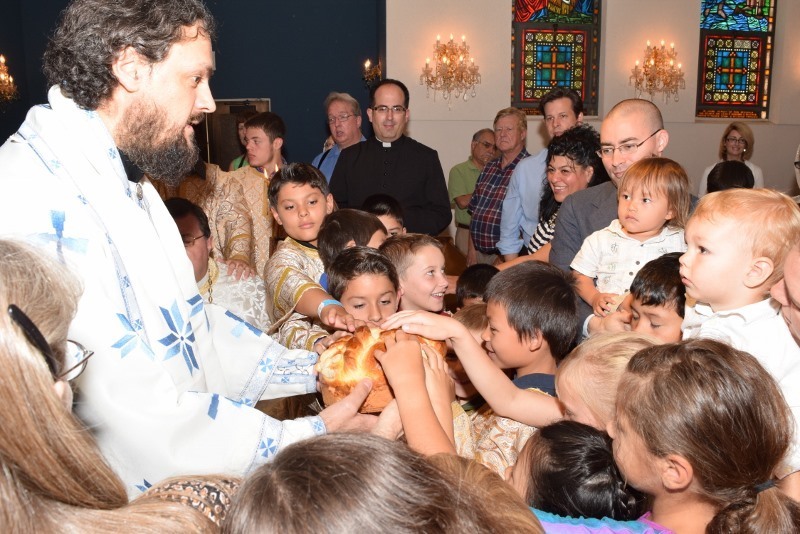 The children of the church delighted in singing the praises of the Holy Apostles, and the bread was broken to be shared by all. 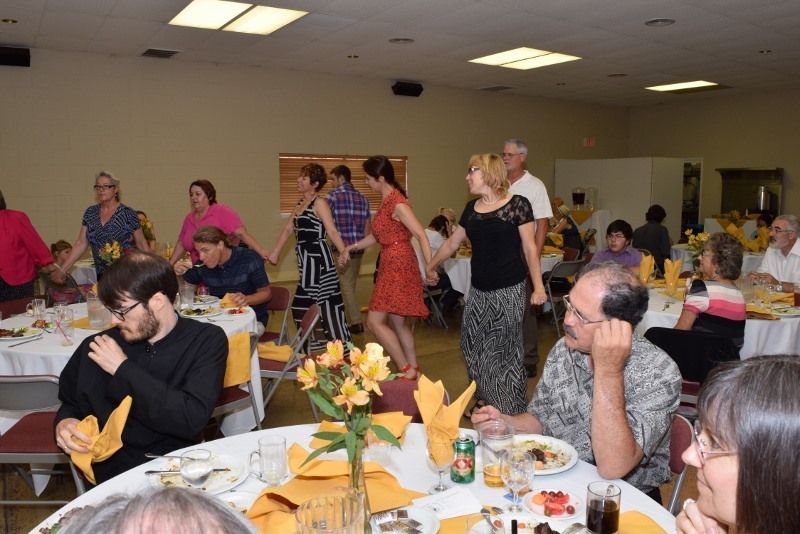 Following the services, the faithful entered the hall and were treated to a delicious meal of grilled lamb, roasted vegetables, and rice lovingly prepared by the Mothers’ Club. 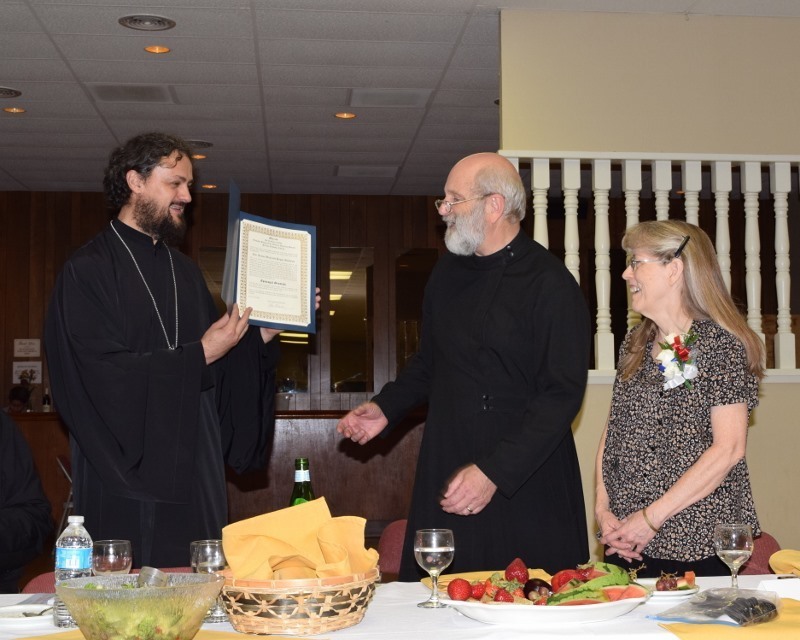 Protodeacon Brad and Djakonica Peggy were presented with an Episcopal Commendation for their dedicated years of service as deacon and leading our wonderful choir. All in all, it was an exceptional day that will long be remembered by all present when His Grace, Bishop Maxim, our beloved Bishop shared his love, leadership, and wisdom with his parishioners at St. Peter the Apostle Church on this, its blessed Feast Day.